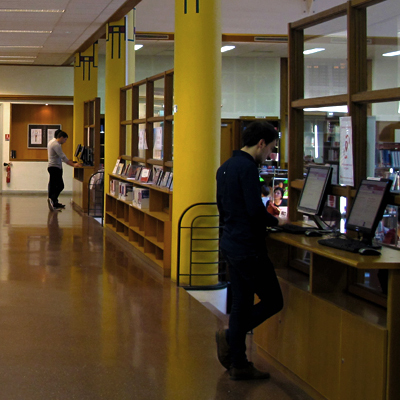 The Cujas Library, an Academic and Research library is operating under the joint supervision of Panthéon-Sorbonne (Paris 1) and Panthéon-Assas (Paris 2) Universities. You can have access to the Cujas library after you have registered and received a library ID. You are required to show your Cujas ID card when entering the building. Most of the building dates from the end of the 19th century and the 1950s. Library services are dispensed according to its layout. Hence, most documents are shelved in closed stacks in the building basement. No food or drink is permitted in all areas of the library. Cell phones should be turned off when entering the building. You can read more about our collections and opening hours on the Cujas Web site, where you will also find a map of the premises. Cujas’ main reading room is accessible to wheelchair users by means of a special lift. Should you need help, please send us an email. Most of our print collections (about 800,000 items) have been acquired from the end of the 19th century until now. They are held in closed stacks. Library employees fetch the documents for you. In our online catalogue, you will find bibliographic records for books and periodicals. To make a request, you first need to activate you reader’s account. Then, you ask for a number which will be assigned to you for the whole day. Finally, you request your item online*. Please check your number on the boards above the Circulation Desk to see when your item has arrived. If you want to read your item on the premises, you will receive a ticket with your number in exchange for your library ID. You may leave the library for a while only if you have a ticket received from the Circulation Desk in the main reading room. - 3 days for « CTLES » material, stored offsite for Paris University libraries. You may request the items in advance and remotely. You will need to set up a date for reading your documents. Such requests should be placed at least 24 hours in advance at the counter for dissertations or by email. If you have borrowing privileges, you may borrow items at the Circulation Desk. Just let us know when you pick up your item(s). You may also check out some circulating items in the main reading room at the Circulation Desk next to the room's exit. All borrowed items must be returned to staff before exiting. Three days before your item is due, you will be notified by an email. You will then be asked to return the item or renew it (once only) via your online reader’s account. We advise you to check your account. You may return the item(s) to staff near the exit door or at the Circulation Desk. Some documents do not circulate outside the library: items published before 1914, reference collections, open stacks materials, journals. You can check their status in the catalogue under “Obtenir un document” ("Requesting an item"). It is not possible to place an item on hold. Cujas librarians select and acquire about 10,000 books a year. You may ask us to buy a new book when you click on “Suggestion d’achat” ("Purchase request") on the Web site. We will let you know by email as soon as your book has arrived. It will be held for you. If you are a Paris 1 or Paris 2 affiliate, you may request an item from another French library or from a foreign research library. You need to fill out a form at the Reference and Information desk in the main reading room. You will be able to find out which library holds it in the Sudoc catalogue (which describes the collections of French academic libraries). For some foreign libraries, you may search the KVK - Karlsruhe Virtual Catalog, or WorldCat. This interlibrary loan service is free when you request books and dissertations from French libraries. However, you will be charged a fee for photocopies of journal articles and for books and dissertations from abroad. We have many electronic resources that are accessible at all library workstations. If you are a Paris 1 University affiliate or a PhD student or lecturer or professor of Paris 2 University, you may also get offsite access. Moreover, digitized books selected from our Rare Book collection are freely available on the Cujas Web site (Cujasnum). A librarian is available at the Reference and Information Desk in the main reading room. At the desk and in a display case, you will find a map of the main reading room and a handout with the Cujas classification by subject. If you need advice about your research, you may also ask a librarian, by sending an email to the following address : CujasFormation[at]univ-paris1.fr . Subject guides, online tutorials and bibliographies have been created by Cujas librarians and placed on the library’s Web site. Please do not hesitate to use them in your research. In addition, bibliographic instruction sessions are regularly scheduled for you. You can send in your queries. You will get an answer within 48 hours. You may enquire about lost property at the Information Desk. News on the home page cover information about the library, academic events and newly acquired books. If you wish to be informed about updates to our website, you can select relevant information and subscribe to an RSS feed. Our catalogue enables you to be alerted about newly-acquired books by email. This requires that you save your current query (as key words and/or authors' names) when you are logged into your account. Your reader’s account enables you to see your current requests, your current loans. You may renew your loans (once only). You can save your citation results in EndNote, Connotea, RefWorks, Delicious or Zotero. We give access to part of our collections (books and periodicals) on the open shelves in our reading rooms. These documents are at your disposal for your main usual needs. In our online catalogue, such items are listed under the rubrics Salle de lecture (Reading room) or Salle des périodiques (1er étage) (Periodicals room, 1st floor). When the documents are available online as well, a sign on the shelf informs you of it. About 10,000 volumes (including major periodicals) are available for reading in the main reading room on the ground floor. Books are labelled with a coloured sticker according to their subject so that readers can find and reshelve them more easily. To enable all readers to retrieve those items, we ask you kindly to put them back on shelf after usage or put them on book trolleys which are sorted out by coloured stickers. The items in the reading rooms cannot be checked out, except for a collection of 1,000 books on a shelf at the entrance of the main reading room. These books have a green label "PRET" ("CIRCULATING ITEM"). The call number of these books begins by PRET. Law codes are grouped together on the left as you look towards the Circulation Desk. Language dictionaries and law encyclopaedias are available behind the Information and Reference Desk. Across from the entrance to the room are displayed new publications of faculty members (Paris1 or Paris2) and colloquia from these two universities. The circulating collection is located on the left when you enter the room, in front of the photocopy room. On the first floor, in the periodicals room, you may request current issues before they are sent to binding and shelved in the stacks. To retrieve an issue, you need to fill out a form at the counter. Moreover, here you can find the last ten years of selected major journals. In exchange for your Cujas ID card, you will get a control card which does not allow a temprary exit. In the periodicals, the library keeps a collection of about fifty main journals with a range of 10 years. On the first floor, lecturers and professors may use the Paul Viollet room, which is limited to their use. One may set aside some books on racks for a few days (please check the procedure). On the second floor, you will find the instruction room (called the François Saleilles room) also available for everyone provided there is no bibliographic instruction session going on. Please check the schedule on the sign on the first-floor sign. The Rare Books room is accessible from the hall (at the entrance to the library) to readers who have made an appointment (from 1 pm to 5 pm, from Monday to Friday). There are no group study rooms. shelves themselves and leave a form with their name in place of the items. In the cloakroom, staff will record whether the item is being read on the premises or being checked out. About 50 workstations are available for research and for requesting items. On the home page of the library Website, you may access the Internet by clicking on "Accès à Internet". You can connect to the network with your own computer via wifi or wired network (the library does not provide Ethernet cables). For anti-virus security reasons, the USB ports are disabled. In the main reading room, you may find a photocopy room (and printing server for online resources or USB stick). Two scanners are also available for photocopying only; they are quicker and safer for bindings. You will find other photocopy machines on the first floor and in the closed stacks. Card dispensers are indicated on this map. Help in using and refilling the cards is available from 2 pm to 5 pm. The library provides employment opportunities for currently registered Ph. D. students. You may apply in April with your C.V. You will do mostly shelving during evening and Saturday shifts.